Archaeological evidence shows a widespread collapse of Bronze Age civilization in the eastern Mediterranean world at the outset of the period, as the great palaces and cities of the Mycenaeans were destroyed or abandoned. Around this time, the Hittite civilization suffered serious disruption and cities from Troy to Gaza were destroyed. Following the collapse, fewer and smaller settlements suggest famine and depopulation. In Greece the Linear B writing of the Greek language used by Mycenaean bureaucrats ceased. 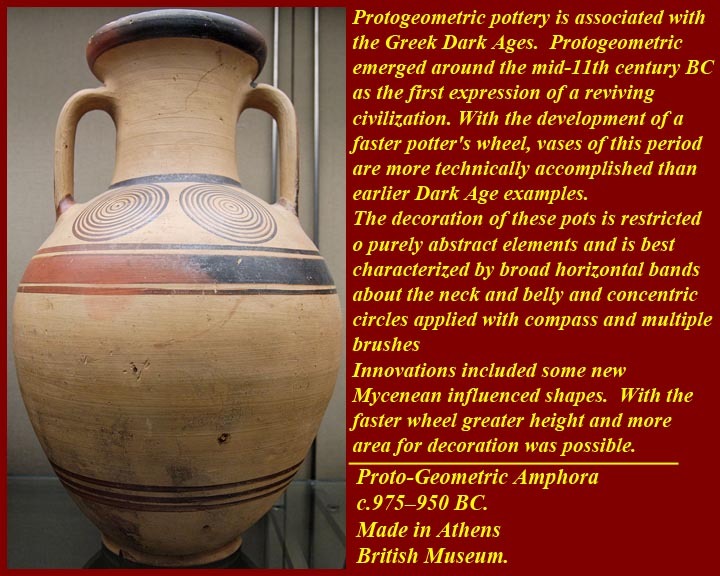 The decoration on Greek pottery after ca 1100 BC lacks the figurative decoration of Mycenaean ware and is restricted to simpler, generally geometric styles (1000–700 BC). It was previously thought that all contact was lost between mainland Hellenes and foreign powers during this period, yielding little cultural progress or growth; however, artifacts from excavations at Lefkandi on the Lelantine Plain in Euboea show that significant cultural and trade links with the east, particularly the Levant coast, developed from c. 900 BC onwards, and evidence has emerged of the new presence of Hellenes in sub-Mycenaean Cyprus and on the Syrian coast at Al Mina. 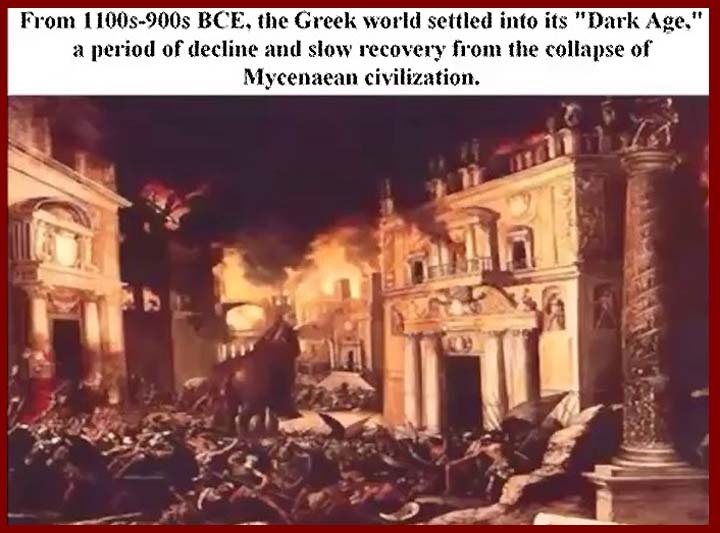 The Greek Dark Age is the interval between the collapse of the Mycenaean civilization, around 1200 BC, and the Greek Archaic Period, around c. 800 BC. 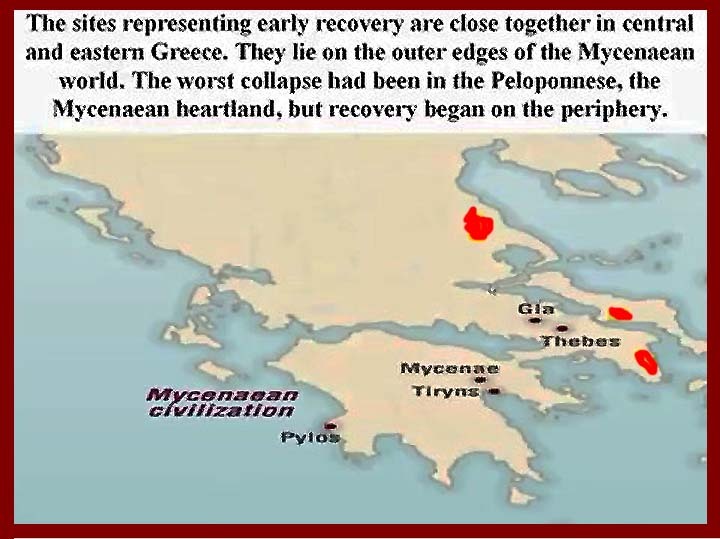 The Dark Age era begins with a catastrophic event: the collapse of the Mycenaean civilization, when all major Mycenaean regional centres fell out of use after suffering a combination of destruction and abandonment. Linear B script, the Mycenaean writing system, was lost shortly after c. 1200 BC; for this reason, we have no first-hand written documents of any kind for this period. 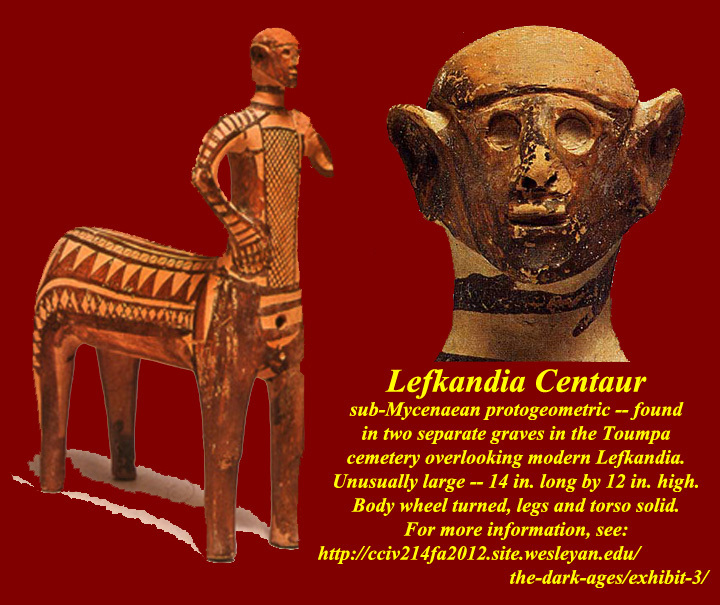 Thus, our understanding of the Greek Dark Age relies largely on archaeological research. 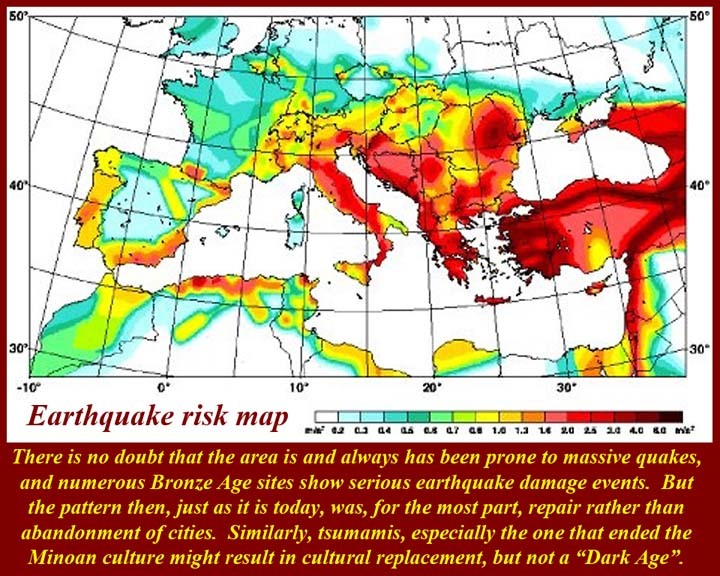 The causes of the general collapse of Bronze Age civilizations around the eastern end of the Mediterranean remain a mystery. The image shows a burning city, and some cities do, indeed, have burn levels at about the right time. But not all do, and, nonetheless, those cities without burn levels, destruction levels, or other evidence of conflict still collapsed. It is now assumed that theTrojan War (or wars) really did occur. It's not so clear that any of the events described by Homer took place exactly as he said they did. It's an extreme stretch to think that any gods or goddesses intervened. The Mycenaean did establish colonies on the Anatolian coast, and it's inevitable that they had unfriendly (at least) interactions with the Hittites, who claimed hegemony in the Area. Troy (what the Hittites called Wilusa (Greek Ilios)) was an Eastern Anatolian Hittite dependency. Homer's Iliad, undoubtedly drawn from earlier oral traditions, can be read as a report of how Mycenaean (Achaean = Ahhawiya in Hittite) behaved - badly - when invading foreign territory and how they justified their actions. 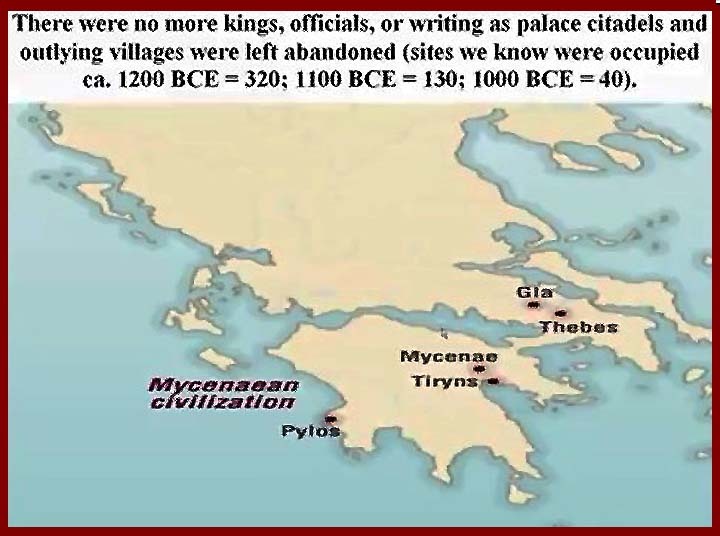 It's also fairly certain that the Mycenaeans, or at least Mycenaean refugees after the fall of Mycenaean Greek mainland cities, formed a component of the eastern Mediterranean invaders that came to be called the "Sea Peoples" in recent modern times. 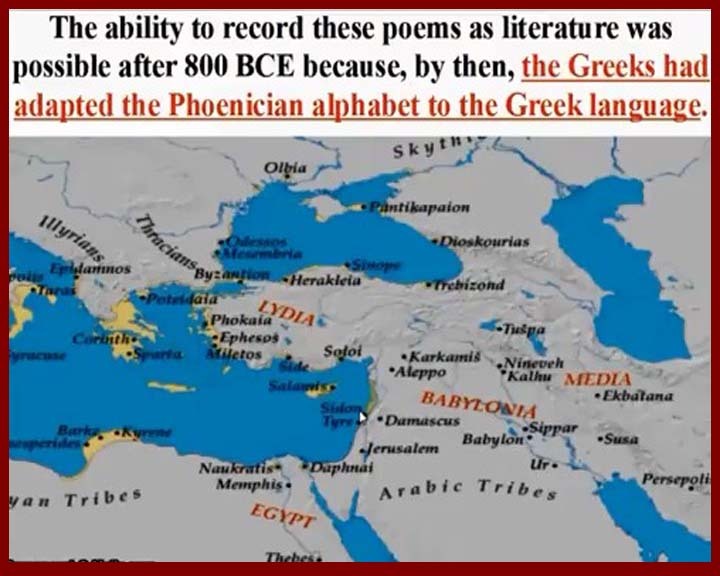 The Dark Age is the gap between the end of the Greek Bronze Age and the point when the recovery had reached the point that writing was reestablished, and that meant that the Mycenaeans who headed east after the fall brought the use of the Phoenician alphabet back to mainland Greece. 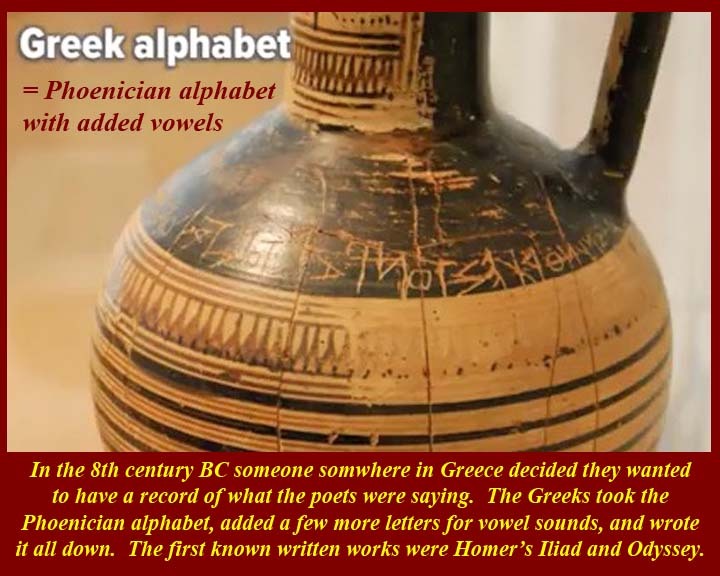 The first known use of the alphabet (and possibly the reason for bringing it to Greece) was the writing down of the Epics of Homer and others. The gap itself was not recorded (no writing with which to record it), but archeological evidence is clear. 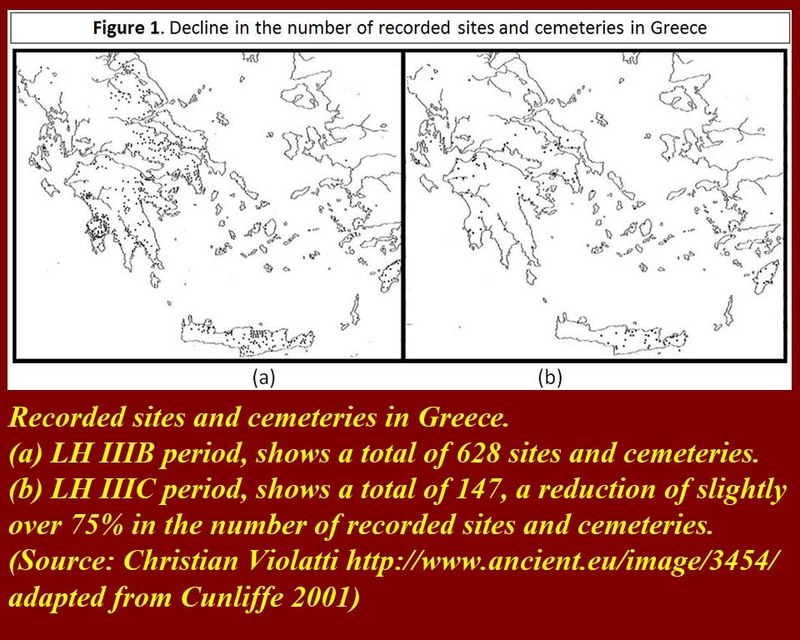 Population declined, settlement sites were abandoned, cemeteries went out of use. When recovery began, it was at the periphery of the old inhabited are. Populations moved during the Dark Age. 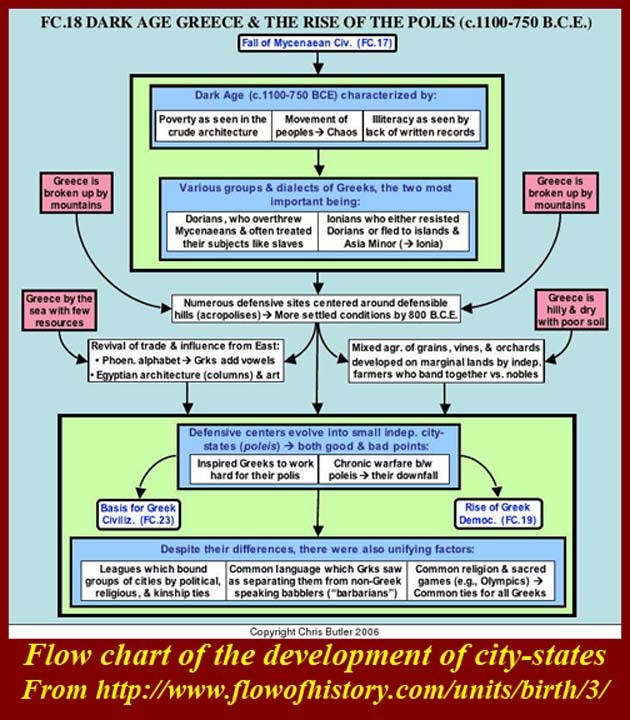 Groups later known as "Dorians" moved southward inside Greece during the 11th and 10th centuries and either reoccupied vacant sites of established new settlements. Some "Ionians" moved to the west coast of Anatolia and further afield (as Sea Peoples?). 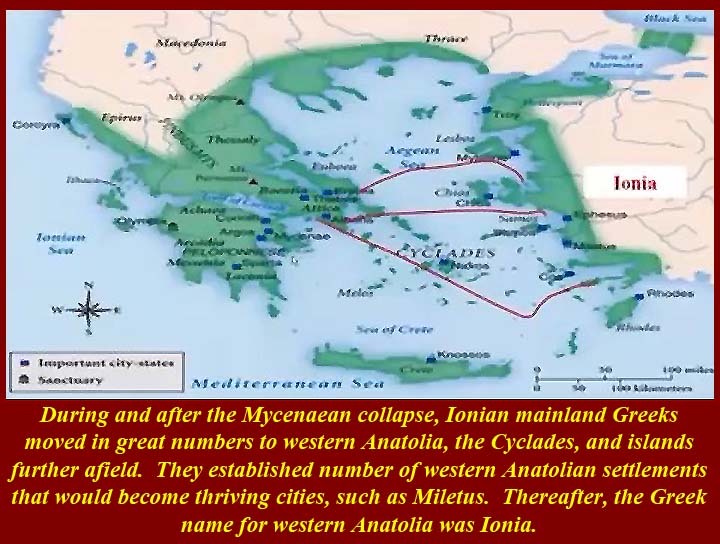 Eventually, western Anatolia became known as Ionia among later Greeks. 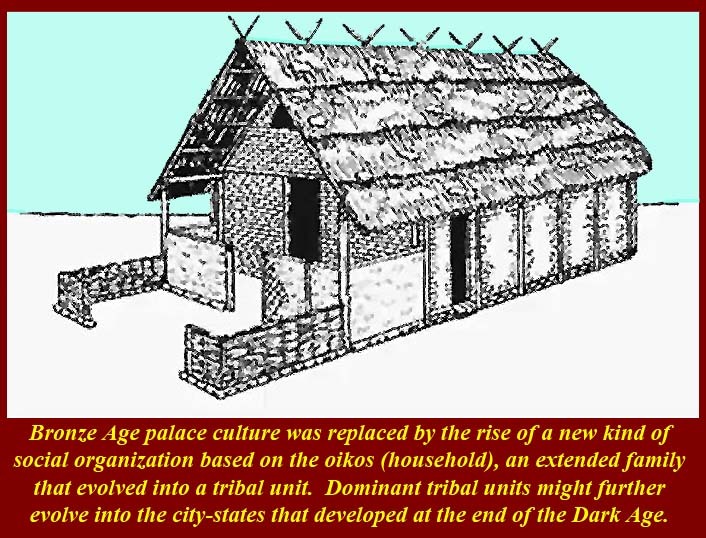 Palace culture was gone and a new model, based on the Oikos or extended family, developed. Extended families evolved int a tribal system when families grouped together for protection. Strong men emerged, and groups moved to high ground for protection. 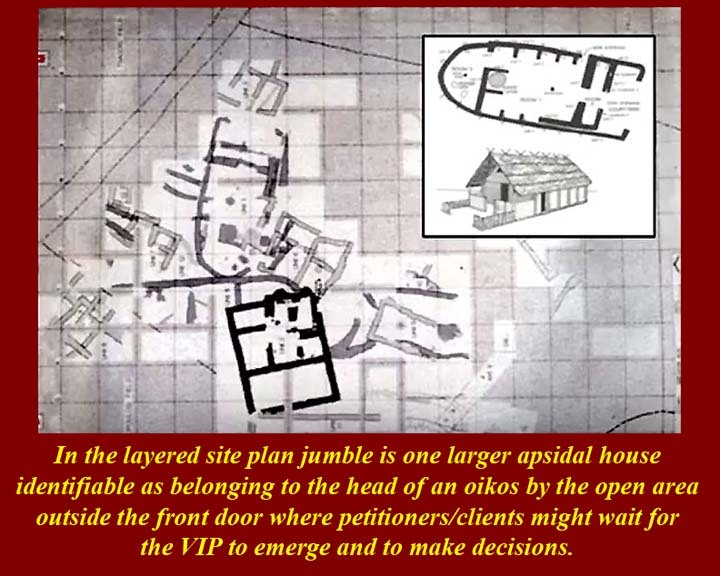 The houses of the chieftains often had open spaces where client-petitioners could assemble. These open spaces eventually became the agoras of city states, poleis. 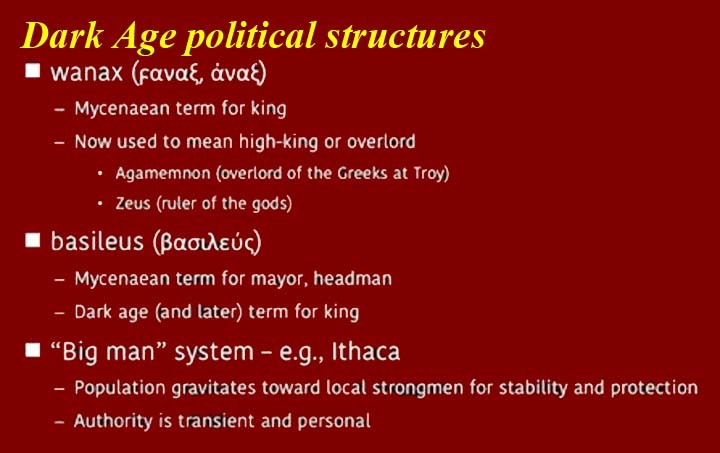 Emerging from the Dark Age were poleis -- city-states -- ruled by basileis -- kings or "machine bosses". One of the peripheral sites that rapidly redeveloped was Lefkandi on Euboea, a large island off the east coast of mainland Greece. Finds on the Island indicate that contact with the east was reduced but not really lost as it had been with most sites on the mainland. 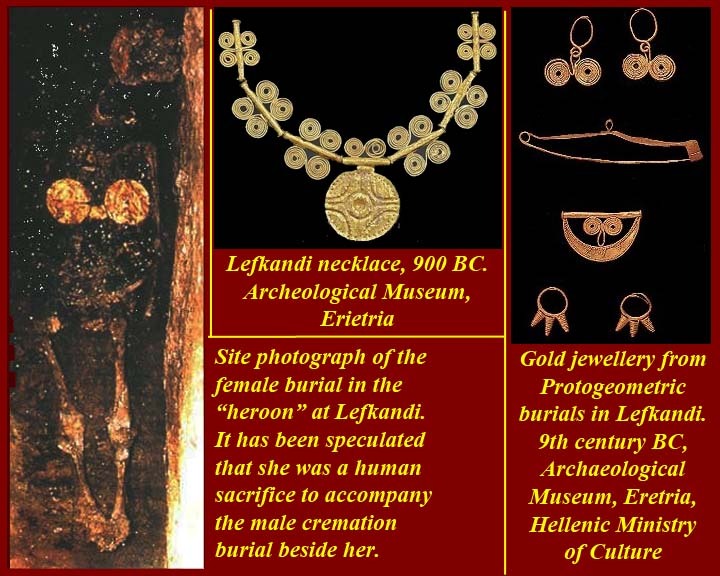 Lefkandi's most important dig is the "heroon" or heroic burial in the center of a large oikos house. After the burial, the whole house was filled and mounded over. The burial consisted of a cremated male flanked by an inhumed female. Two horses were also buried, and it has been suggested that the woman and the horses were sacrificed to accompany the dead man. 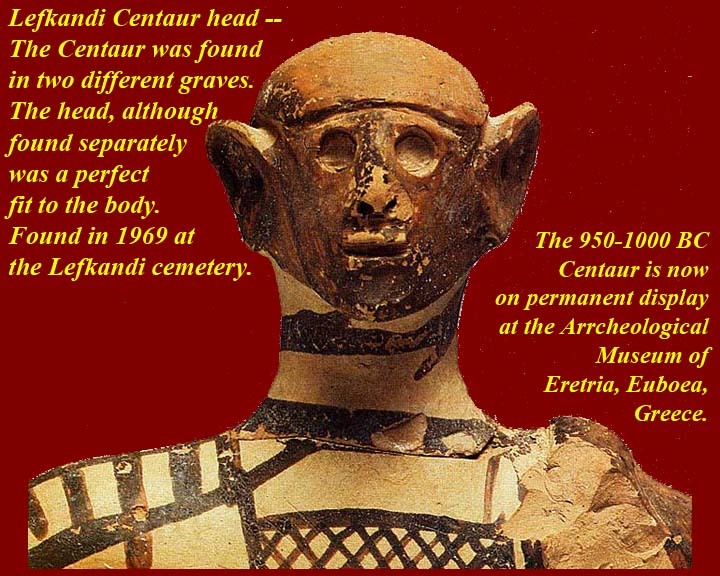 More on the Lefkandi burial later -- Lefkandi is mentioned here only as an example of early recovery in the Dark Age. 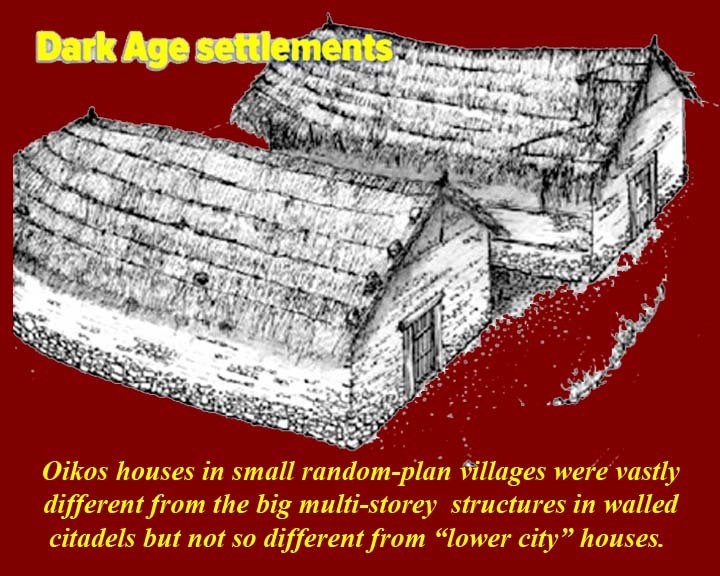 Other settlements redeveloped (or developed from rural settlements) later. 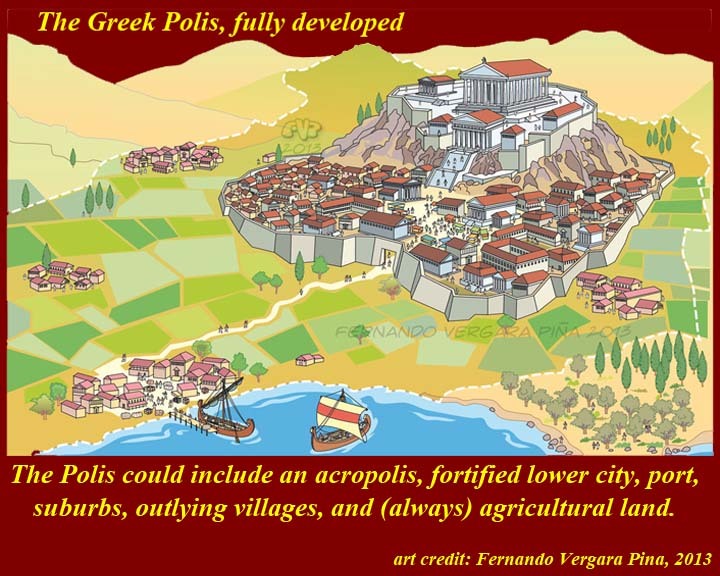 Athens was an exception, because it apparently was not fully depopulated in the general collapse, although it did suffer cultural losses including the loss of writing. The inhabitants who remained in Athens were sometimes called Pelasgians by later Greeks, although that term is now usually applied to pre-Greek-speaking indigenes of the Aegean area. 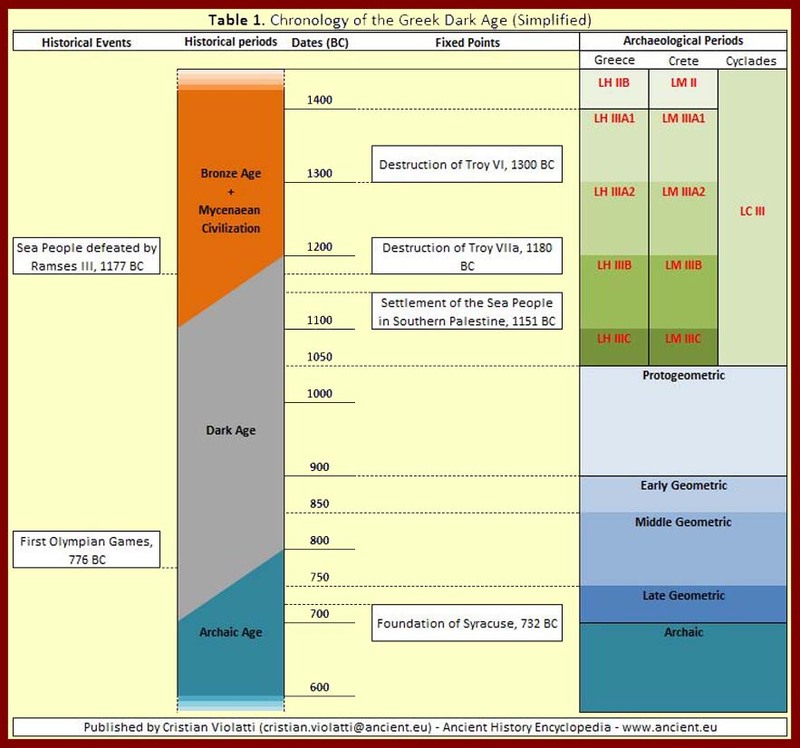 Classical Greeks appear to have used the term more broadly to mean "earlier people" or folks before the Dark Age. Recitation of "epics" may have been a feature of court life before the dark age. 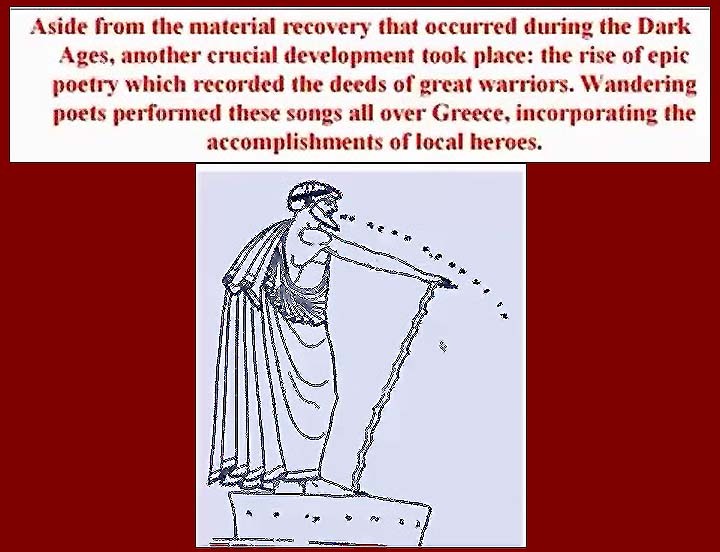 It is thought that recitation of what became the Homeric Epics and the other heroic epics of the Epic Cycle that filled out the Trojan War prelude, story, and postlude started very early and perhaps even contemporaneously with the war. 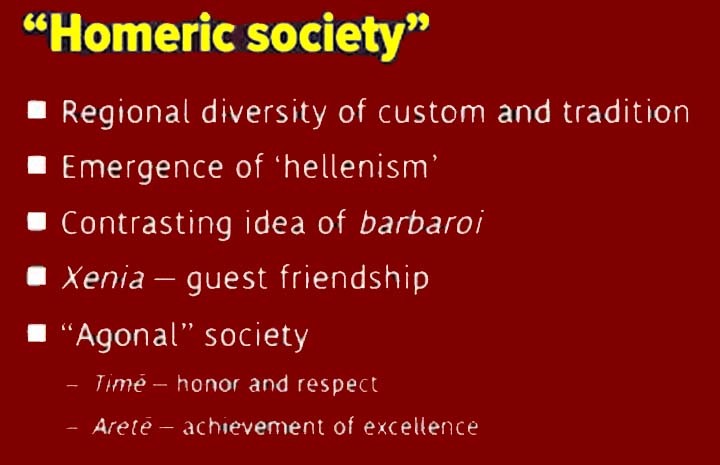 (This is because to preserve the meter in recitation it is necessary to pronounce the early Greek "digamma", which was lost in dark age Greek dialects that were eventually encoded with the Phoenecian alphabet; to preserve the meter, the "digamma", usually transliterated as a "w" would have been pronounced as "oo", e.g., what we today read/pronounce as "ilios" would be pronounced as "oo-ilios" in Homeric Greek). 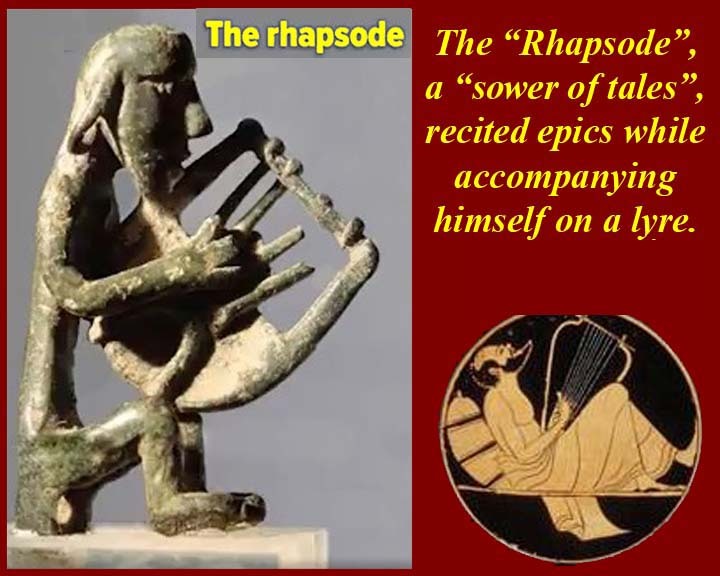 A singers of the Epics were called "guy (and assuredly always a guy) who stitched together tales" or in, in Greek, a ῥαψῳδός (rhapsodos), and if Homer sang his Epics, rather than just writing them down for other singers and posterity, he was a rhapsodos. There may have been other stories in other epics that didn't make the cut to get to our time. 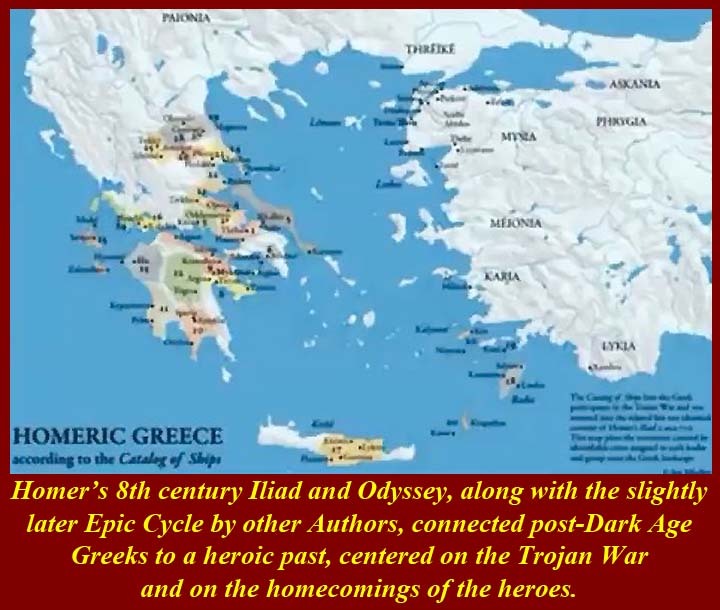 The Homeric Epics and the Epic Cycle were the best sellers of their day and continued to be best sellers into Roman times, because the Julio-Claudian imperial dynasty (Julius Caesar, Augustus, Tiberius, Caligula, Claudius, and Nero) promoted the Troy stories. 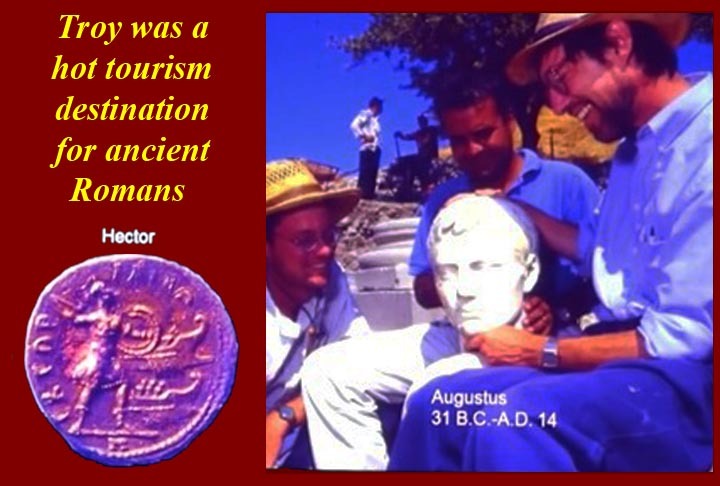 We inherited the Achaeans and Trojans rather than some othe forgotten (not promoted) tales. 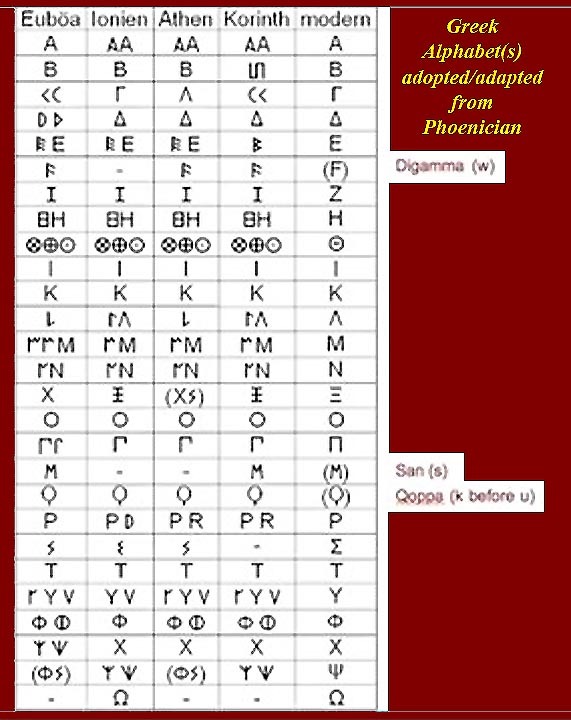 The Greeks of the Dark Age, like many others in the Eastern Mediterranean, adopted and adapted the Phoenician alphabet and that allowed them to write down the epics that they so much appreciated. Different areas of the Greek speaking world used slightly different versions of the alphabet, and that served well until larger and larger groups united. All peoples cherish their own heroic myths, and especially myths that accommodate and glorify the things that the group wants to believe about themselves. 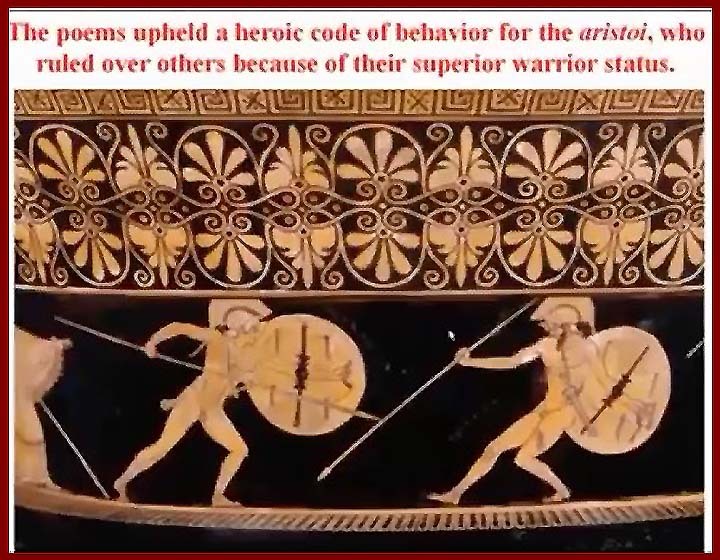 The Greek Epics transmitted the heroic code of the aristocrats of the past and showed that men could compete, at least on the moral plane with the gods -- or at least it showed that the gods were at least as petty, untrustworthy, disloyal, unhelpful, discourteous, cowardly, dirty, and irreverent. (So any former Boy Scout could tell you that they were just the opposite of the "Scout Law".) That would in turn justify just about any dastardly behavior by men and Women -- you could be just like the gods and goddesses. The "heroic code" transmitted by the epics in reality was pretty worthless, but it did let the bosses do what the wanted to do . "Might-have-been" epics that didn't reinforce what the power brokers wanted didn't stand a chance of being remembered. 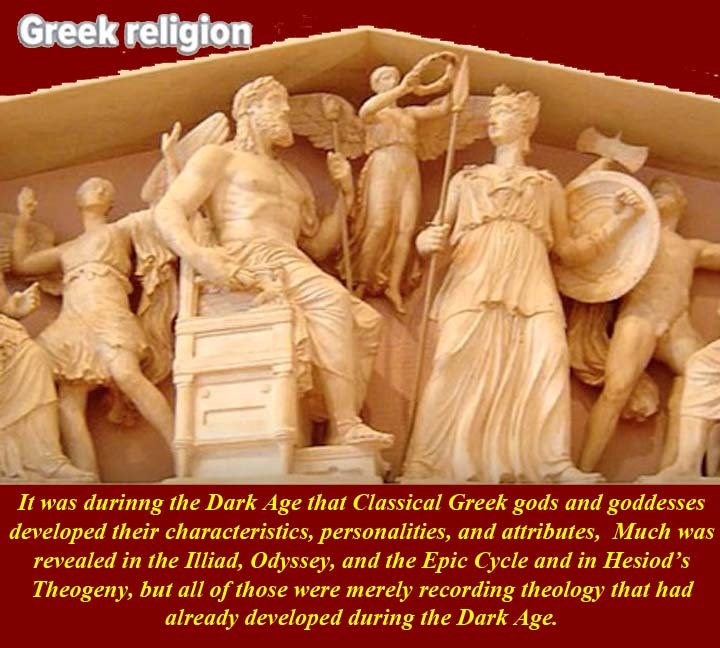 Greek polytheism developed during the dark ages a "seers" and proto-priests repeated the attributes and action of pre-fall deities and they added information based on the acts and personalities of the deities as demonstrated in the oral epics. After writino was reestablished they wrote it all down. What has come down to us is the Theogeny of Hesiod. Hesiod (Greek=Ἡσίοδος Hēsíodos) was a Greek poet generally thought by scholars to have been active between 750 and 650 BC, around the same time as Homer. 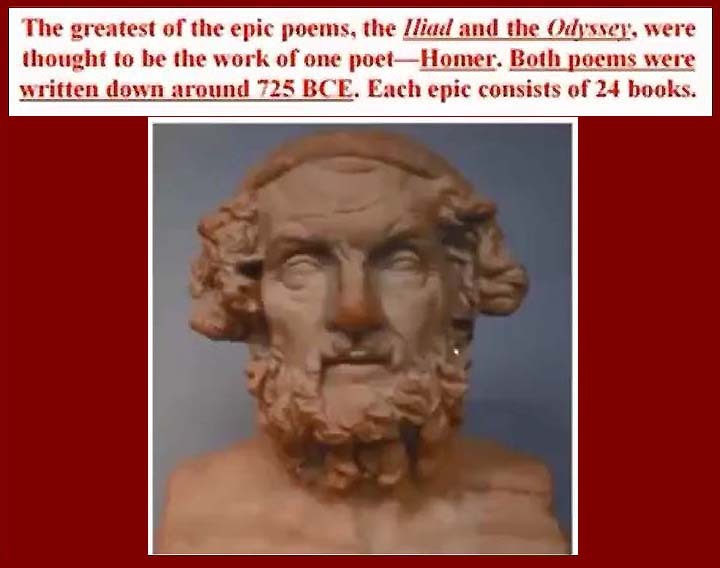 His is the first European poetry in which the poet regards himself as a topic, an individual with a distinctive role to play.- Ancient authors credited Hesiod and Homer with establishing Greek religious customs. 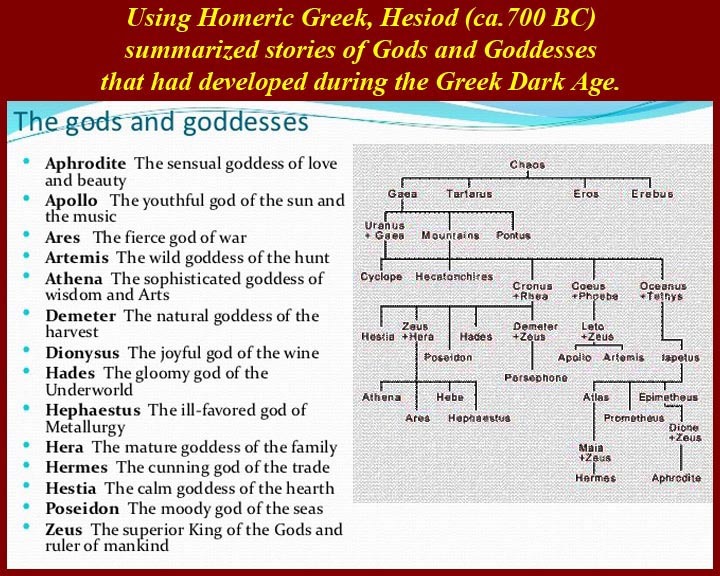 Modern scholars refer to Hesiod as a major source on Greek mythology, farming techniques, early economic thought (he is sometimes considered history's first economist), archaic Greek astronomy and ancient time-keeping. The Evelyn-White 1914 English translation of the Theogeny is on the Internet at http://www.sacred-texts.com/cla/hesiod/theogony.htm. 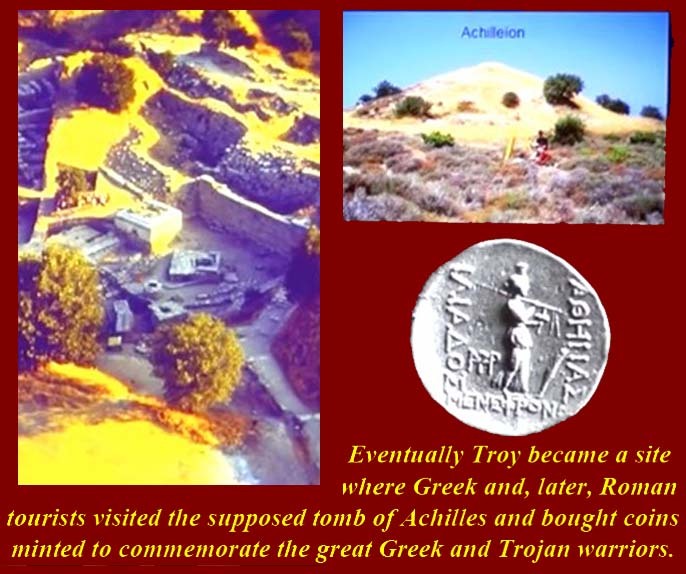 Troy became the touchstone first for post--Dark Age Greeks (and others) and then for Romans. It became a pilgrimage site for later leaders, among them Alexander, Xerxes (a Persian other), Augustus, Hadrian among the ancients. Commoners visited and still do and take home (still) commemorative coins minted for the purpose. 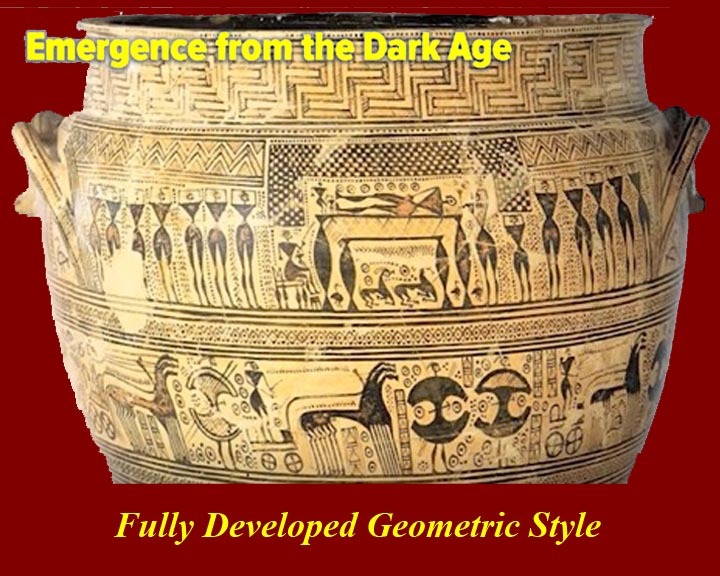 Geometric art is a phase of Greek art, characterized largely by geometric motifs in vase painting, that flourished towards the end of the Greek Dark Ages, circa 900 BC to 700 BC. Its center was in Athens, and it was diffused amongst the trading cities of the Aegean. 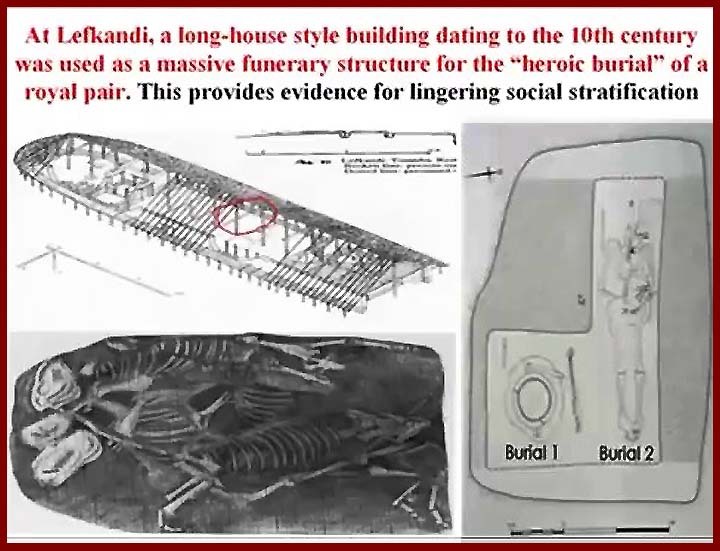 Modern archaeological evidence identifies the start of iron production as taking place in Anatolia around 1200 BC, though some contemporary archaeological evidence points to earlier dates. 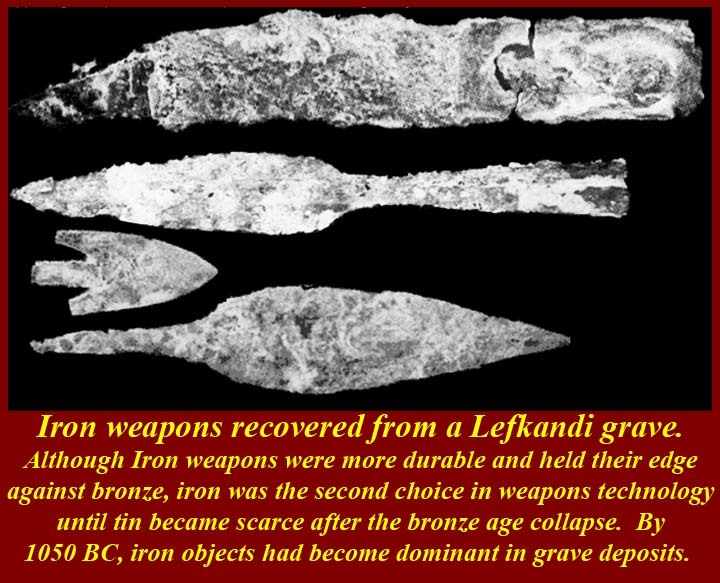 (There certainly was worked meteoric iron before 1200 BC.) 1200 was about the same time that Mycenaeans were colonizing Wastern Anatolia. It appears that that mainland Greeks knew about iron making, but continued to use bronze as long as tin and copper were easily available. When those metals became scarce due to the breakdown of international trade at the end of the bronze age, iron came into use even though smelting that metal was much more difficult. It did help that iron ores were available in Greece; iron, although harder to make, was actually cheaper and less prestigious. The idea of Sea Peoples arose after translation in a french translation of Egyptian reliefs of Ramses III at Medinet Habu in 1855. The relief mentioned by name a number groups conquered, captured, and settled in Egypt by Ramses. 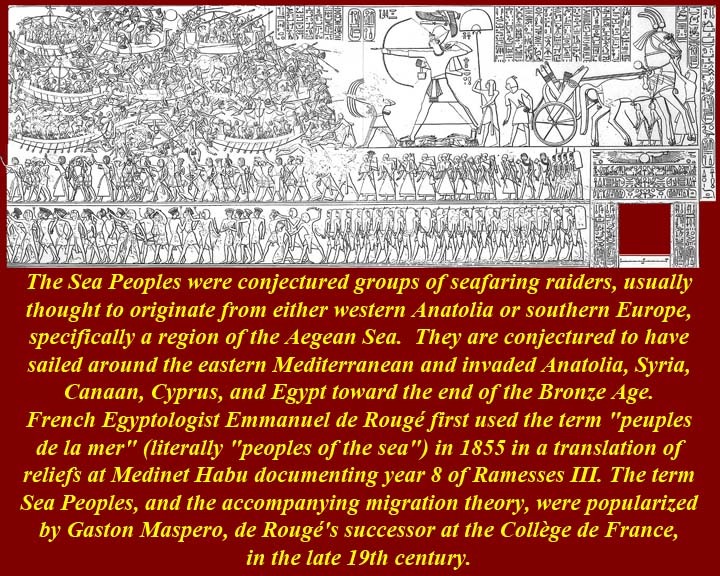 The translator, French Egyptologist Vicomte Olivier-Charles-Camille-Emmanuel de Rouge, called them all "Sea People" even though, as it turned out, most of them have now been identified as migrants who arrived by land and even though the hieroglyphs made no mention of Sea People. 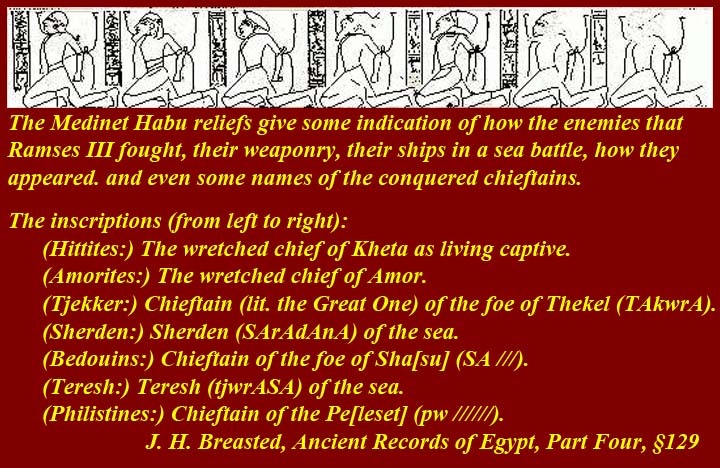 See https://en.wikipedia.org/wiki/Sea_Peoples and http://www.salimbeti.com/micenei/sea.htm and http://www.reshafim.org.il/ad/egypt/sea_peoples.htm. 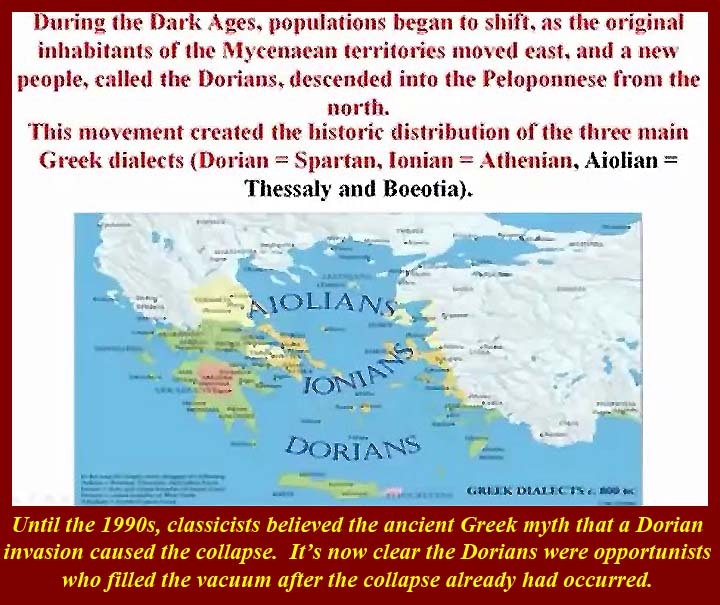 There were, in fact, refugees/migrants/colonists/invaders who came by sea to various Mediterranean ports -- Mycenaean Ionians -- but there's more than an even chance that, rather than causing the collapse of the Bronze Age centers, they moved into the vacuum just as the Dorians had done in mainland Greece. There may have been some fighting in some places, but archeological evidence suggests that in most places the Mycenaean/Ionian new arrivals just mixed with the local villagers as did new arrivals from other migrating groups. In many places where Mycenaeans/Ionians settled, archeological investigations have revealed a melding of styles of pottery, art, and architecture. The pattern after earthquakes (and tsunamis) has always been to rebuild rather than abandon. It is true that cultural change and even replacement might occur, but seldom were sites (and certainly not all sites) abandoned. 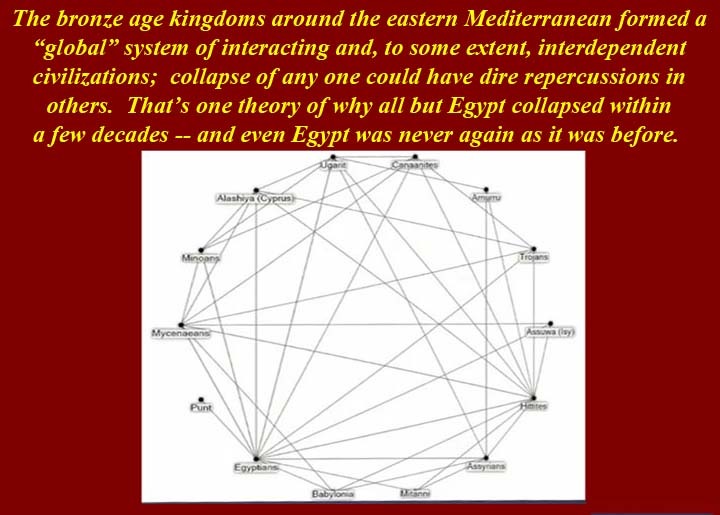 Interconnection, domino effect, overpopulation, over use of resources, tyranny leading to internal revolts, etc. have all been seen as leading to "systems collapse," a modern term that just means everything fell apart as a result of there not being enough glue to hold things together. But "Everything fell apart just because it couldn't stay together" is circular reasoning, as accurate as that might be. It was inevitable that recent research would point to climate change. But it's also a cogent argument. 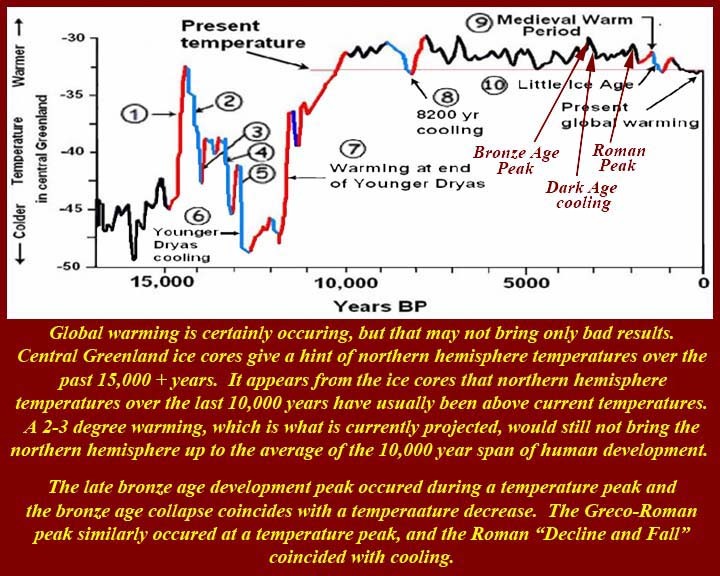 Paleometeorologists love to make graphs and charts, and this one seems to indicate that a cold snap lasting many years could have decreased agricultural productivity to the point that large urban populations could not be supported (just a it is known to have happened at the end of the Medieval Warm Period). Earlier drought theories are subsumed in this theory. Look at the chart and decide for yourself.